Teens Arrested On Gang Suspicion Are Released Due To Lack Of Evidence After his arrest in New York and immigration detention across three states, a 16-year-old has been released. A federal judge ruled there wasn't enough evidence to prove he was an MS-13 gang member. 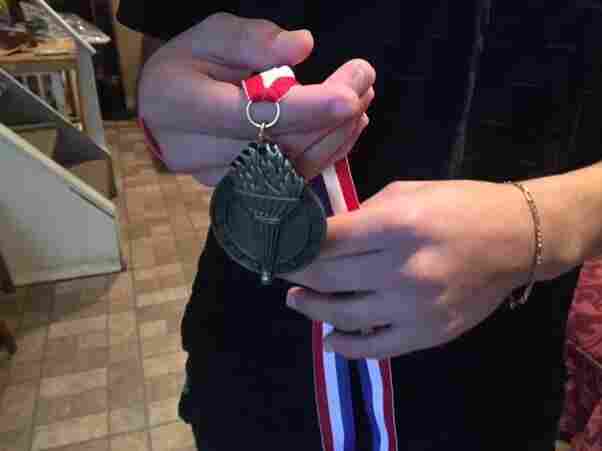 A Long Island teen accused of being an MS-13 gang member holds a medal he won in immigration detention. A judge has ruled there's not enough evidence to hold him. Over the summer, police and immigration agents were convinced a 16-year-old teen in Brentwood, Long Island, was a member of the violent, multinational gang known as MS-13. The teen had been spotted various places — at school, in a car, and walking home with people police believe are MS-13 gang members. And police said the teen scribbled the numbers 503 in a school notebook. It's the international calling code for El Salvador, where he's from, but police consider it a gang symbol. The teen was never accused of a crime. But he was arrested and sent to an immigration detention facility in Virginia, then California, then New York. Teens known as "unaccompanied minors" can be detained without being accused of a crime because they don't have full legal status. At least 32 immigrant teens who were resettled on Long Island after arriving at a U.S. border without a parent were arrested for alleged gang membership. It was part of a Homeland Security operation, called Operation Matador, a Trump administration effort to crack down on the MS-13 gang and immigrant crime. But the American Civil Liberties Union says immigration agents and police don't have the evidence to back it up. And now judges are siding with the teens, and letting them go. "Arrests were based on nothing more than a third-hand report from an unidentified local police officer that a child was wearing a certain article of clothing or was seen with certain people," said William Freeman, a lawyer with the American Civil Liberties Union of Northern California. The ACLU is representing the teens in a class-action lawsuit against Immigration and Customs Enforcement, the Justice Department and the Office of Refugee Resettlement. That's the agency that oversees "unaccompanied minors." "It's almost as though the police are saying we know [a gang member] when we see it, trust us,'" Freeman said. "And the whole point is that's not enough." In immigration court judges repeatedly stated they weren't convinced the teens were gang members. But the judges didn't have the authority to release them from detention. A federal judge in Northern California recently ruled that immigration judges must release teens who don't pose a danger. "They can't just arrest someone, ship them across the country and lock them up based on nothing more than suspicion," Freeman said. As of Monday, judges had released 14 immigrant teens, saying the federal government failed to justify their detention. The teen who wrote the numbers 503 in his school notebook was the first to get out. NPR agreed not to use his name because his case for a green card is still pending. "I thought I'd never see my 'mami' again," he said in Spanish. "And I just kept telling myself that God knows well who I am and that he was going to help me get out." The teen was held for five months on insufficient evidence that a judge called "many layers of hearsay." 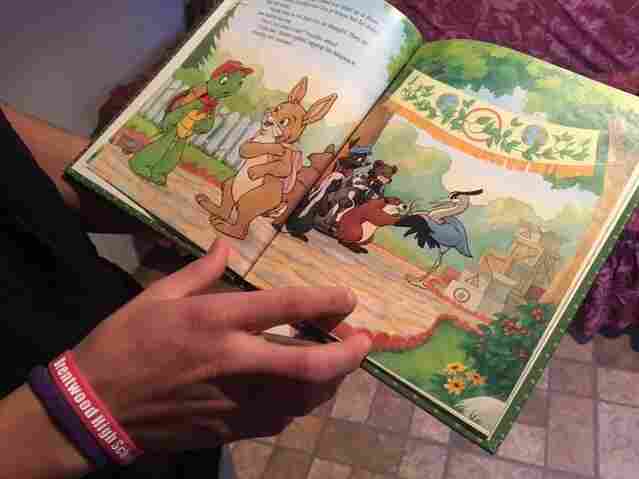 A Long Island teen accused of being an MS-13 gang member started learning English by reading children's books in the five months he was detained. A judge has now ruled there's not enough evidence to hold him. He started learning English in detention by reading children's books, including one called Kenny and the Little Kickers," he said. Most of the English he learned, though, relates to his experiences in detention. "I want to keep studying and show everyone that I can be an important person in this country," he said. But the police commissioner in Suffolk County, Timothy Sini, remains convinced the teen — and others who were detained — are MS-13 members. "We stand by every single detention that we collaborated with ICE on," Sini told News 12 Long Island. And he said he makes no apology for his strategy to crack down on the gang. "This decision from a federal judge in California changes nothing." His police officers are still conducting surveillance on suspected gang members on the streets and in public schools, and providing that information to immigration authorities. For their part, ICE officials insist that agents do not profile suspects or "make arrests with prejudice."